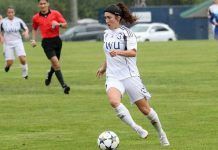 When the 2016 Canada West women’s soccer season started, Deanna Brady of Richmond, BC was the third goalie on the Thompson Rivers University WolfPack. On Sunday (Oct 23), you wouldn’t have known it as she stood tall in the Pack’s 2-0 loss to the visiting University of Saskatchewan Huskies at Hillside Stadium. The Huskies were making their first ever visit to Hillside Stadium and Kamloops to play soccer. The teams were tied 0-0 after the first half with Brady making 15 saves. In the contest she handled 31 shots as Thompson Rivers finished the regular season with a record of 1-12. The Huskies were battling for second spot in the Canada West Prairie Division and finished at 8-3-3. 80:48 – Sask– Leesa Eggum (4th year, striker, Saskatoon, SK) on cross from Erica Hindmarsh . Her fourth goal of the year. SASK 2 TRU 0 FINAL. OF NOTE: The “TRU Bookstore/McDonalds Leader of the Pack Player of the Match” was Harding whom, before the game, wask honored their lone graduating player. Harding (3rd year, midfield, Salmon Arm, BC) still has another year of U Sport Eligibility left but is poised to graduate this spring from the Thompson Rivers University Nursing program. The Thompson Rivers University WolfPack women’s basketball team finished the the Carleton Ravens Metro Glebe exhibition tournament with a victory. They downed the Concordia Stingers of Montreal 62-57 to finish with a record of 1 and 2.. The WolfPack trailed 13-10 after the first quarter but outscored the Stingers 13-6 in the second to lead 23-19 at the half. The WolfPack will spend next weekend in Victoria at UVIC playing two exhibitions before opening up the 2016-17 Canada West regular season on the Warner Rentals Court at the Tournament Capital Centre with a weekend series (Nov 4-5) against the University of British Columbia Thunderbirds. Tip off on Friday (Nov 4) will be 6 pm. They will lay the University of Alberta Pandas on Friday October 28 th and then the University of Saskatchewan Huskies on Saturday, October 29 th. Chelsey Hoey of the WolfPack was named a tournament all-star.